THESPIAN FESTIVAL REGISTRATION IS NOW CLOSED!!!! The 2018 Arizona Thespian Festival is November 16th and 17th at the Phoenix Convention Center. The AZ Thespian Festival is NOT open to the general public. All students must attend with their high school’s Thespian Troupe Director or Drama Director. *****Still in effect, ALL adults are required to undergo a background check in order to attend the AZ Thespian Festival. If an adult refuses, consent form isn’t sent by deadline or doesn’t pass the background, they will be unable to attend. This includes teachers, chaperones, presenters and exhibitors. And there will be NO REFUND. There are two ways to have the background check completed. 1. Fill out the consent form and email it to jenell.riordan@arizonathespians.com or 2. Enter your information yourself click here and follow the directions. For more festival information, please refer to the documents and forms listed below. Remember there are many steps to the registration process. Please refer to the Thespian Teacher Guidebook (link located below) to assist you. Arizona Thespians Code of Conduct Each school must have a copy on file. 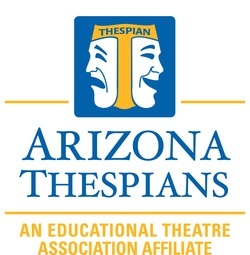 2018_AZ Thespian Festival_consent_and_acceptance_form (for both students & adults) please note, ALL adults will be required to undergo a background check. If an adult refuses or doesn’t submit the consent by the deadline, they are unable to attend. Arizona Thespian-AIA One Act Festival Rules – Here are the rules for one act plays. One Acts are filled on a first come, first serve basis. There are 48 slots available this year. Production name has to be supplied at the time of registration to hold your spot. TBD or TBA is not allowed. You must register in the registration portal.